Vacation Rentals can be like a home away from home and are especially worth it if you’re planning a 2+ day holiday. Although there are usually cleaning fees applied (hence the 2+ day recommendation), vacation rentals give you plenty more space than a hotel or resort and provide a bigger variety of options to suit different needs: ocean view, in town, full kitchens, extravagant bathrooms – there’s something for everyone and a little research can go a long way! 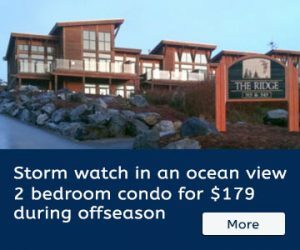 Tons of options exist in both Tofino and Ucluelet, and while there’s typically a bigger selection in Tofino, vacation rentals 30 minutes south in Ucluelet are often slightly cheaper and provide a quieter escape at the end of the day. Cabins, ocean view condos, vacation houses and a fishing lodge great for large groups in both Ucluelet and Tofino. Discounts for longer term stays. The stunning, 1700 square feet condos overlook the west coast – you don’t want to miss these!